Looking out across the sea on one side and hemmed in by the towering Apennine peaks on the other, Campania is a region well worth exploring. A treat for all five senses, everyone from foodies to sun-seekers will find their corner of paradise in this Italian region. Comparitively unknown compared to the tourist hubs of Veneto and Tuscay, Campania is a region that engages all five senses. The wonderful views out to sea and up the slopes of Mount Vesuvius are a delight to behold. The lively noises filling the streets of Naples are music to the ears. As for taste and smell, look no further than the exquisite aromas of Campanian cuisine, which includes pizzas, delicious desserts, and some of the best coffee in the country. This rich Mediterranean region is dotted with small towns, villages and districts rich in history, art and tradition set to beautiful natural backdrops. Looming over all proceedings, Vesuvius, dark and mysterious, loved for its beauty and feared for its power, is Campania's most astounding natural asset. Then Naples, famous worldwide for the intensity and passion of its cuisine, mingles culture and vulgarity, sanctity and profanity, joy and melancholy. Overlooking the sea, Sorrento, with its rugged coastline and small beaches, is one of the most stunning spots on the Campania coastline. Thanks to ceaseless work by locals, much of the area's cliff-like coastline has been turned into a series of terraces that gradually thin out towards the sea. They are mostly used for the cultivation of lemons and oranges, as olive groves and vineyards. Passing through you'll catch wafts of orange blossom, mingled with the salty sea and delicious home cooking. Away from the busy cities and famous villages, one of Campania's most attractive offers is its spas, places where you can regenerate and regain a little balance, pampered by natural hot springs. You'll find some of the best in Ischia, one of the pearls of the Gulf of Naples, which, thanks to its volcanic origins, boasts some of the best hydrothermal spas in the world. Capri is now doing it too. After Florence, Rome and Venice, the small but famous island in the Bay of Naples is applying a visitor's tax. On 1 January 2012, an overnight stay tax ranging from 2 to 4 euros (£1.60 to £4.20) per person per day, depending on the category of the hotel, was established. More precisely: 5 euros for 5 stars, 4 euros for 4 stars, 3 euros for 3, 2 and 1 stars, and 2 euros for an inn or a B&B. Children up to 10 are exempt from this tax. Lovers of history and architecture should make time to visit Paestum, Herculaneum, Pompeii and Torre Annunziata, Certosa di Padula and the famous Royal Palace of Caserta, known for its starring role in several Star Wars films. 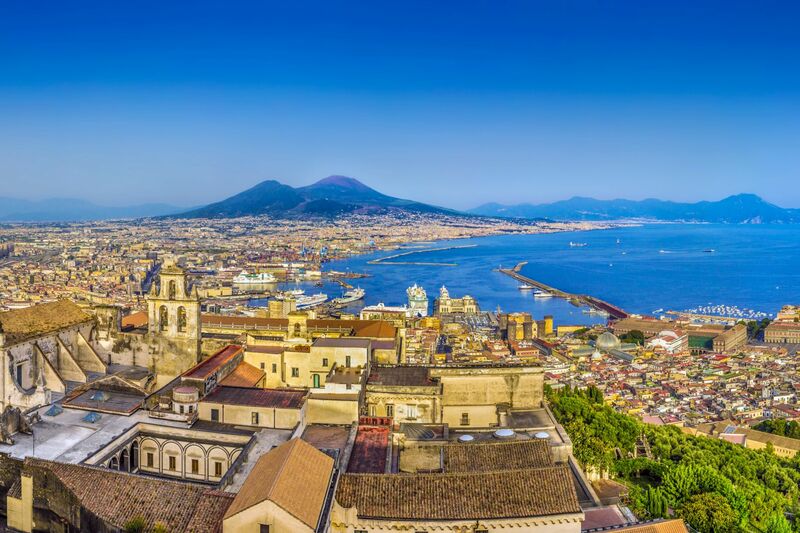 All within easy distances of each other, the towns of Caserta, Benevento, Avellino, Salerno and capital city Naples are packed with extraordinary architectural and cultural interest. In fact, those who want to spend their holidays in this region must choose from an infinite number of wonderful places, difficult to pack into one trip alone. Campania's UNESCO World Heritage sites alone could take up an entire week of visits. Naples is a unique city. Home to incredibly hospitable people, its historic centre is one of the largest in Europe and can be traversed much like an open-air museum. Everywhere you look, there are fascinating views, tabernacles, churches and baroque obelisks. You will encounter old craftsmen, from Nativity scenes (St. Gregory of Armenia) to master violin makers, down to the ancient village of Goldsmiths. Countless itineraries can be followed by choosing to visit the castles, museums, villas and historical palaces, or, more simply, taking a tour of the many churches that contain sculptural and pictorial masterpieces of great value. The Archaeological Area of Pompeii, Herculaneum and Torre Annunziata, three cities which, in AD 79, were completely destroyed by Vesuvius, are amongst the most unique UNESCO World Heritage sites of the region. The volcanic lava destroyed these towns, but at the same time exceptionally preserved them, allowing us to study their lives in minute detail today. 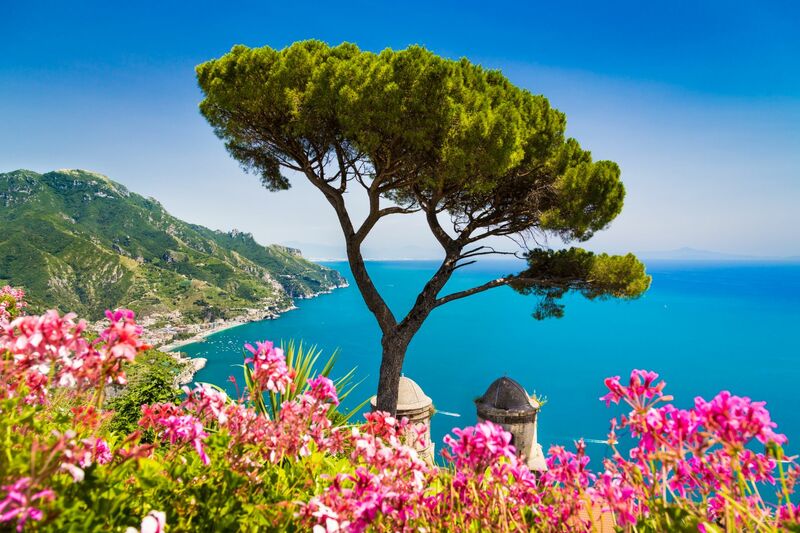 The Amalfi Coast is one of the region's most visited areas: bays, coves and picturesque villages that cling precariously to the cliffs create an incredible landscape. The turquoise sea is mixed with the green of the Mediterranean, whilst the colours of the small houses merge seamlessly with each other, creating one of the most beautiful stretches on the Italian coast. The villages of Sorrento, Amalfi, Ravello, Vietri sul Mare and Positano are just some of the beautiful places that can be found along the coast (12 in all), with their ancient alleys, small arches and intimate squares. The Reggia di Caserta is another very important architectural site, as well as a UNESCO World Heritage site. It is a masterpiece of Italian Baroque. Visiting its interior will give you an idea of just how much impressive artwork are held here, from stucco reliefs to frescoes, sculptures and inlaid floors. It is a work of monumental proportions: four courtyards, 1,200 rooms, more than 30 impressive staircases, including the famous Grand Staircase with 116 steps, and a beautiful park to encircle the house. The Partenopee Islands, though lesser known than the Amalfi Coast, are also worth visiting. Here you will find a place of rare beauty sculpted by the wind, the sea and man. Amongst the best places to stay are Capri, Ischia and Procida, where visitors can enjoy spas, boat trips and walking. Pizza is the dish that everyone thinks of when you talk about Naples, along with the rest of Italy. Today, it has been exported all over the world, and can be found topped with the most varied, and strangest ingredients. However, the traditional pizza is the Margherita. It has a dough base made purely out of local products, thinner in the centre and with the famous and slightly thicker crust around the edges, and is topped with tomato sauce and Fiordilatte mozzarella (ask for a Margherita DOC if you want buffalo mozzarella) with a sprig of basil in the centre for garnish. Legend has it that this particular pizza was invented at the end of the 19th century by a 'pizzaiolo' (pizza chef) who wanted to dedicate the tri-coloured dish to Queen Margherita. Fried pizza is another traditional dish, but one less known to tourists. It basically consists of a pouch of pizza dough filled with ricotta, provola cheese, and 'ciccioli' (pork scratchings). More classic pizza chefs might add pieces of sausage or ham. The whole thing is then immersed in boiling oil to be cooked. Neapolitans worship coffee, and many will not pass a day without it. Taken at a bar counter or poured fresh from a Neapolitan coffee maker at home, it must be hot, very black, strong, and full of flavour. Real buffalo mozzarella cheese (listed by Italy's 'DOP' or protected designation of origin) is produced between Falerno and Castelvolturno. It is made using milk from animals raised in the open air, and is worked by expert cheese makers who 'cut' the runny paste while it is still hot. Buffalo mozzarella is a real treat and must be tried at least once if you're passing through this region. You can actually watch it being made if you visit one of the cheese dairies open to the public. These vegetables, native to Naples, are only grown in the region near the site of the ancient capital of Parthenope. They belong to the broccoli family but vaguely resemble spinach, and have an especially bitter flavour. They often feature on pizzas - particularly on top of the mildly spicy classic 'salsicce and friarielli' (sausage and friarielli) - and can be served up alongside meat dishes or as a filling in 'tortani' (savoury pies). Find weekly weather forecasts for Campania . Different criteria make it possible to predict with precision the best time of year to go to Campania . A comprehensive weather score, made up of temperature indicators, bad weather predictions, sunshine levels and wind speeds, will allow you to choose the activities best suited to the weather conditions and therefore make the most of your holiday in Campania . The big international brands are mostly found in the city centre (Via Toledo and Corso Umberto). By contrast, you will find lots of authentic locally-made products to choose from when it comes to finding a souvenir to bring home. For example, you can find clothes made of Positano or Capri linen, as well as leather accessories by Aldo Tramontano (leather goods since 1865) on Via Chiaia. Alternatively, you might pick out a tie from Marinella on Riviera di Chiaia (since 1914). Food fans may wish to stop off at Gay Odin, a historic chocolate shop that opened at the end of the 19th century. In addition to selling chocolate in boxes and bars (including the especially distinctive 'cioccolata foresta'), it has also been selling ice cream for several years (Gelateria Gay Odin, Via Benedetto Croce, in the historic centre near the Santa Chiara cloister). The exact addresses of the various shops can be found on the following website: . As far as mozzarella is concerned, there are several different schools of thought. Some connoisseurs will only eat mozzarella from the cheese makers of Battipaglia, while others swear just as strongly by the version from Mondragone. Needless to say, both varieties taste absolutely delicious.